Jews of Uzbekistan insist that late President Islam Karimov's ruthless and often brutal policies were necessary to keep out radical Islam. Driving through this dusty desert city of many ornate and ancient mosques, Shirin Yakubov recalls the ruthlessness of her country’s recently deceased president of 25 years. Like many from her social class, she credits the absence of radical Islam from public life to Karimov’s no-nonsense rule. Under Karimov, who died Sept. 2 from a stroke at 78, the all-powerful SNB security service was responsible for the torture and “disappearance” of countless dissidents in a country with no free press and a no-entry policy for foreign journalists. With the passing of Karimov, an isolationist who strived to stay on good terms with but independent of Russia and the United States, Yakubov and other relatively affluent Uzbekistanis - including the country’s 13,000 remaining Jews - look to an uncertain future. Foreign diplomats here blame Karimov not only for systematic violations of human rights, but also for holding back mineral-rich Uzbekistan from realizing its full economic potential. Under Karimov, the country's restrictive policies included an obstructive visa regime for outsiders and an official exchange rate that is half the actual black-market value of its local currency, the sum, against the dollar. But many Uzbekistanis and all Jewish community leaders, it appears, say they are grateful to the late leader for the stability achieved under his rule and the growth that did occur. The provincial city of Tashkent grew into a clean and safe metropolis of 3 million residents with an efficient subway system, shining conference halls and stadiums, hygienic marketplaces and peaceful parks where magpies and Indian starlings bathe in fountains amid hedges of purple basil plants. “No one is going to call me a 'dirty Jew' here,” says Arsen Yakubov, Shirin’s husband, as he walks to one of Bukhara’s two synagogues for services on Friday evening. Even before going inside, he donned the traditional, square and ornamented Bukharian hat that serves many Jews here as a kippah. Beyond the threat of retribution by an authoritarian government against anyone who punishes them, the Jews here are also safe because they are widely accepted as a native ethnicity, just like ethnic Tajiks and Russians. They have, after all, maintained a documented presence here for 1,000 years, which some historians believe actually goes as far back as 1000 B.C.E. In Bukhara, where anywhere between 40 to 150 Jews live – depending on the definition one applies – some are greeted with “shalom” by their Muslim neighbors as they gather for evening and morning prayers. Achieving a minyan, the quorum of 10 Jewish men necessary for some prayers in Orthodox Jewish communities, is often an issue. At the local Jewish school, a predominantly Muslim student body is taught to sing "Hatikvah," Israel’s national anthem – reflecting the desirability of the school and a Jewish population that shrunk after the fall of the Soviet Union. Some 75,000 Jews left their former Soviet republic after its fall. 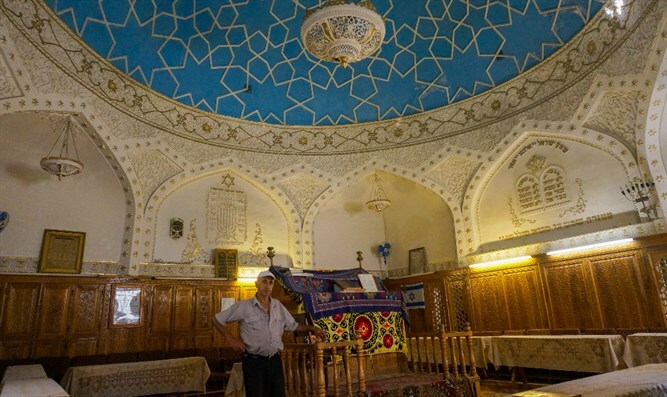 “We are brothers, the Muslims and the Jews, and we live like it, too,” says Yossif Tilayev, the rabbi of a Jewish population of 200 in Samarkand, Uzbekistan’s second city, and caretaker of its turquoise-domed, 19th-century synagogue, which is among Central Asia’s prettiest. But to many, this record of coexistence is no guarantee against an Uzbekistani version of the interethnic and interreligious wars that have ravaged neighboring countries, including Tajikistan, Turkmenistan, Kyrgyzstan -- and Afghanistan. Even under Karimov, the Yakubovs from Bukhara have been feeling growing religious radicalization. While thousands of villagers moved into their city, the educated elite has largely left in favor of Tashkent, the capital. In 2014, this process of internal migration was slowed considerably after the government toughened its enforcement of regulations - internal visas known as “propiska” - that limit where citizens may live and work. “I can’t go to the swimming pool like I used to 10 years ago because they stare at my bathing suit,” she says. “I don’t want my daughter wearing shorts because it’s beginning to attract too much attention. I no longer feel comfortable here." “But we will leave soon - and quickly, if anything bad happens after Karimov,” she says.